George Döring Ludwig was born in Johnstown, Pennsylvania in 1922. He received his Bachelor of Science degree in Chemistry from the St. Vincent College, Latrobe in 1944 and his medical degree from the University of Pennsylvania in 1946. 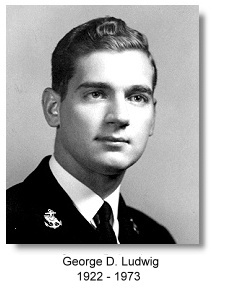 After his graduation, and between 1947 and 1949, Ludwig was on active duty as junior Lieutenant at the Naval Medical Research Institute in Bethseda, Maryland. There, with an inquisitive mind, and upon the suggestion from surgical colleague Charles Kirby at the University of Pennsylvania that ultrasonics might be developed into a technique for the detection of gallstones, he began experiments on animal tissues using A-mode industrial flaw-detector equipment (initially with the Sperry reflectoscope). Ludwig designed experiments to detect the presence and position of foreign bodies in animal tissues and in particular to localise gallstones, using reflective pulse-echo ultrasound methodology similar to that of the radar and sonar in the detection of foreign boats and flying objects. Ludwig systematically explored physical characteristics of ultrasound in various tissues, including beef and organs from dogs and hogs. To address the issue of detecting gallstones in the human body, he studied the acoustic impedance of various types of gallstones and of other tissues such as muscle and fat in the human body, employing different ultrasonic methodologies and frequencies. His collaborators included Francis Struthers and Horace Trent, physicists at the Naval Research Laboratory, and Ivan Greenwood, engineer from the General Precision Laboratories, New York, and the Department of Research Surgery, University of Pennsylvania. For several years, Struthers and Trent have been working at the Naval Research Laboratory on ultrasonic equipments for metal flaw detection and measurement of metal thickness. In their setup, very short pulses of ultrasound were employed using a combined transmitter/ receiver transducer. Echo signals from the reflected soundwave were recorded on the oscilloscope screen. Pulse repetition was at 60 times per second. He further surgically implanted gall stones in the back muscles of a dog, and into the gall bladders of three dogs -- and in each case was able to detect a distinct ultrasonic signal corresponding to the biliary calculus. He achieved the first in vivo ultrasound detection of a human gallstone located in a gall bladder-- albeit not a human gall bladder. The observations were detailed in a 30-pages Project Report to the Naval Medical Research Institute dated 16 June 1949. A substantial portion of Ludwig's work was considered classified information by the Navy and was not published in medical journals. Although Ludwig's work had started at a considerably earlier date, notice of his work was not released to the public domain until October, 1949 by the United States Department of Defence. The June '49 report is considered the first report of its kind on the diagnostic use of ultrasound from the United States. Ludwig further studied transmission through living (in situ) human extremities, directing the probe to avoid bone, so as to measure ultrasound velocity and acoustic impedance in muscle. These investigations also explored issues of attenuation of ultrasound energy in living human tissues, impedance mismatch between various tissues and related reflection coefficients, and the optimal sound wave frequency for a diagnostic instrument to achieve adequate penetration of tissues and resolution, without incurring tissue damage. These studies had helped to build the scientific foundation for the clinical use of ultrasound. "The possibility of detecting neoplasms by use of ultrasound has been considered. As with foreign bodies, the detection of a tumor would depend upon the impedance mismatch between it and the surrounding normal tissue. Tumors vary in compostion and physical properties. It is reasonable to assume that in most cases, the density, elasticity, and velocity of sound would differ but slightly from that of normal tissue. In addition, tumors rarely have sharp margins. For these reasons, and from conclusions drawn from our preliminary studies, we are of the opinion that the detection of tumors by the echo method is not a likely possibility, although it is conceivable that further improvements in instrumental design and refinements in technique may render it possible. It seems advisable to investigate methods using transmitted energy. In this way, one might capitalize upon differences in absorption of ultrasound in various types of tissue. With a transducer on one side to transmit the energy, and another on the opposite side to receive it, an area could be scanned. The amount of energy received would vary from point to point, as it would consist of the input energy minus that reflected, scattered and absorbed. Any structure that would not permit as large transmittance of energy as the surrounding medium, could be outlined with a suitable detector. In this way it might be possible to outline a tumor in certain regions of the body." In the following year, Greenwood and General Precision Laboratories made available commercially the "Ultrasonic Locator" which Ludwig used for "use in Medicine and Biology". Suggested usage indicated in the sales information leaflet already included detection of heart motion, blood vessels, kidney stones and glass particles in the body. Ludwig's pulse-reflection methodology and equipment in his follow-up experiments on sound transmission in animal tissues were after earlier designs from the work of John Pellam and John Galt in 1946 at the Research Laboratory of Electronics of the Massachusetts Institute of Technology (M. I. T.), which was on the measurement of ultrasonic transmission through liquids. The M. I. T. was then very much at the forefront of electronics and ultrasonics research. A significant amount of physical data and instrumentation electronics were in place in the second half of the 1940s. Among other important original findings, Ludwig reported the velocity of sound transmission in mammalian soft tissues was estimated to be between 1490 and 1610 meters per second, with a mean value of 1540 m/sec. This is a value that is still in use today. He also determined that the optimal scanning frequency of the ultrasound transducer was between 1 and 2.5 MHz. His team also showed that the speed of ultrasound and acoustic impedance values of high water-content tissues do not differ greatly from those of water, and that measurements from different directions did not contribute greatly to these parameters. This and his other collaborative work at the M. I. T. later on were considered very important seminal work on ultrasound propagation characteristics in mammalian tissues. Ludwig had taken up appointment at the Massachusetts General Hospital (M. G. H.) as assistant resident from July 1, 1949, and as Research Associate in Physics (Acoustics) of the M. I. T. His experiments with physicist Richard Bolt, neurosurgeon H Thomas Ballantine Jr. and research physicist Theodor Hueter from Siemens, Germany were centered around the detection of intracranial pathologies by ultrasound in a technique similar to that of Karl Dussik in Austria. The team switched their experiments from using transmission techniques initially to reflection techniques which Ludwig had been using. However their data showed that the velocity of sound through normal and tumor tissues in the brain were essentially similar and the conclusion was that the small amount of reflection at the interface between the tissue and the ventricles/ tumors made the technique much less valuable than the transmission technique first employed by Dussik. Unfortunately, this notion was later proven to be quite incorrect and pulse reflection ultrasound was soon employed as the mainstream technique in nearly all diagnostic investigations. Between 1950 and 1951 the team imaged actual patients at the M. G. H. but the results were largely inconclusive, despite various adjustments to the instruments and methods. In April 1951 the group announced discontinuation of the project and experiments. For reasons that are not exactly clear today, the group had not further pursued ultrasound diagnosis in other body organs. * The most likely reason could be that in preliminary experiments, both the reflection and transmission methods had not been able to produce adequate resolution (either in practice or in theory) of the organs or tumors in question. At M. I. T. and M. G. H., enthusiasm in applying ultrasound to medical diagnosis had somewhat dampened. Both Bolt and Ballantine had moved away from this area of research. Hueter left M. I. T. in 1956 to work for the Submarine Signalling Division of the Raytheon Corporation, before moving on to work for the Honeywell Inc.
George Ludwig took up residency training in Internal medicine at the University of Pennsylvania Hospital in 1950. He became an Associate in Medicine and Fellow in Biophysics in 1952. In 1956 he spent a year working at the Biochemical Division of the Medical Nobel Institute, Stockhom, Sweden, under Nobel Prize Laureate Professor Hugo Theorell. In 1955 he was certified by the American Board of Internal medicine and in 1960 was appointed Associate Professor of Medicine at the University of Pennsylvania. During the year 1962, Ludwig took a leave of absence to head a nine-person CARE/ MEDICO team restoring hospital services in Algeria, Africa just after the country gained its independence from France. The mission was much commended by the then President, John F. Kennedy. In the same year he was honored with the Christian R. and Mary F. Lindback Award for distinguished teaching. Ludwig's field of research and expertise were on metabolic, endocrine and molecular diseases, and making special contributions in areas of the abnormal Heme, porphyrin, indoles, calcium-phosphate metabolism, parathyroid diseases and inborn errors of metabolism. Throughout the years, he maintained an active interest in the burgeoning applications of ultrasound in clinical medicine. His publications numbered over 60. A mentor to many, George Ludwig was considered an exceptional and inspiring teacher, academic, scientist, clinician, educationalist and leader in the field of Internal Medicine. In 1967, Ludwig was appointed full Professor of the department and Chief of the Section of Metabolism and Clinical Genetics, a speciality which was just starting to develop. 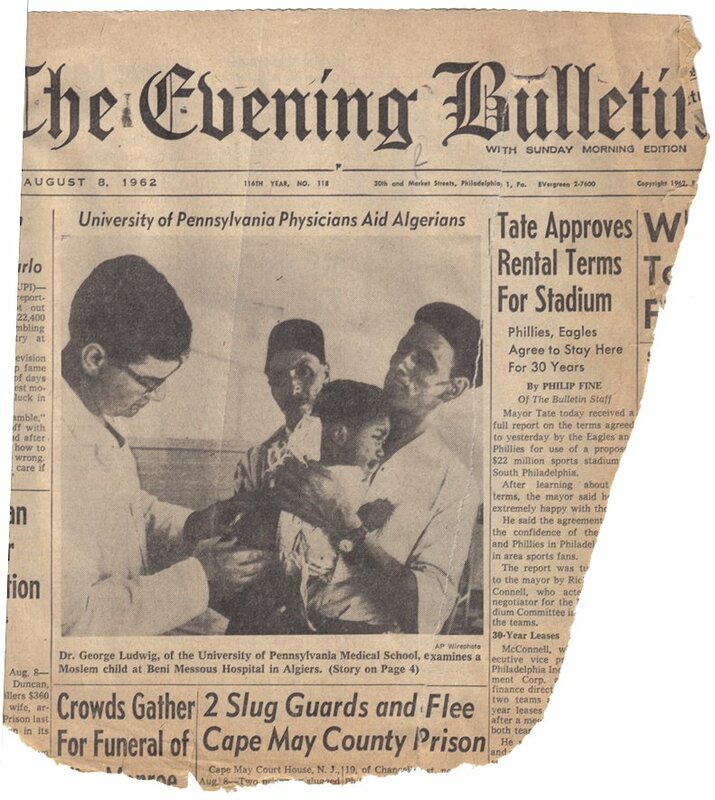 Aside from his teaching and research committments, he was also active serving in the American College of Physicians where he was their Governor of Eastern Pennsylvania from 1967-1969, and on the National Board of Medical Examiners. He was chairman of the committee looking at changes to the National Board Examinations, in particular, Part III, Patient Management Problems. On this subject he wrote an authoritative chapter in the book "Measuring Medical Education" edited by John Hubbard. Between '69 and '70 he was on sabbatical as visiting Professor at the Institute of Physiological Chemistry and Physical Biochemistry of the University of Munich, Germany, working on research projects with Professor Theodore Bücher. 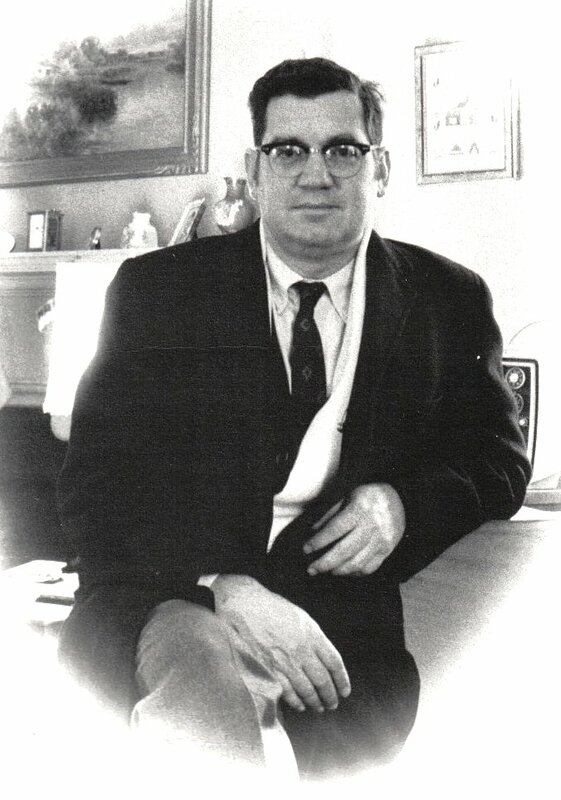 George Ludwig left the University of Pennsylvania in August 1970 to become the Founding Chairman of the Department of Medicine at the newly established Medical College of Ohio at Toledo. Another ultrasound pioneer in the 1960s, Atis Freimanis, whom Ludwig helped to recruit, was Founding Chairman at the Department of Radiology. Tragically, Ludwig died of a cerebral hemorrhage in 1973, bringing a brilliant career to an untimely end at the age of 51. He was survived by his 5 children from his first wife, Rosemary (Lynch), who passed away in 1963. The Medical College of Ohio is now called Medical University of Ohio. Part of the text was adapted from a biography of Dr. Ludwig, written by Dr. Peter White, Professor Emeritus of Medicine, Medical University of Ohio. Personal communications. Portraits of Dr. Ludwig courtesy of Dr. White and the Ludwig Family. Various information and images of Dr. Ludwig's early equipment, paper on the detection of gallstones, document from the Department of Defence and President Kennedy's commendation letter courtesy of the Ludwig Family. *See: "Seeing with sound: A study of the development of medical images" by Edward Yoxen, in "The social construction of technological systems: New directions in the sociology and history of technology" . The MIT Press, Cambridge, Massachusetts. Bijker W., Hughes T., Pinch T., (ed). 1987: 281-303. Utterback, R.A. and Ludwig, G.D. A comparative study of Schedules for Standing Watches Abroad Submarines based upon body temperature cycles. Naval Medical Research Institute Reports, Project #004 003, Report No. 1, March 1949. Struthers, F.W., Trent, H.M. Naval Research Laboratory, Washington, D.C. (1947) Ultrasonic Measurement of Wall Thickness in Diesel Cylinder Liners. J. Acoust. Soc. Am. 19: 368-371. Ludwig, G.D. and Struthers, F.W. Considerations underlying the use of Ultrasound to detect Gallstones and Foregn Bodies in Tissue. Naval Medical Research Institute Reports, Project #004 001, Report No. 4, June 1949. Ludwig, G.D. and Struthers, F.W. Detecting gallstones with ultrasonic echoes. Electronics 23:172-178. (1950). Ludwig, G.D. and Ballantine, H.T. (1950) Ultrasonic irradiation of nervous tissue. Surgical Forum, Clinical Congress of the American College of Surgeons P. 400. Ballantine, H.T. Jr., Ludwig, G.D., Bolt, R.H. and Hueter, T.F. Ultrasonic localization of the cerebral ventricles. (1950) Trans. Am. Neurol. Assoc. 38-41. Ballantine, H.T. Jr., Bolt, R.H., Hueter, T.F. and Ludwig, G.D. On the detection of intracranial pathology by ultrasound. (1950) Science 112.525-528. Article by Dr. Joseph Woo.